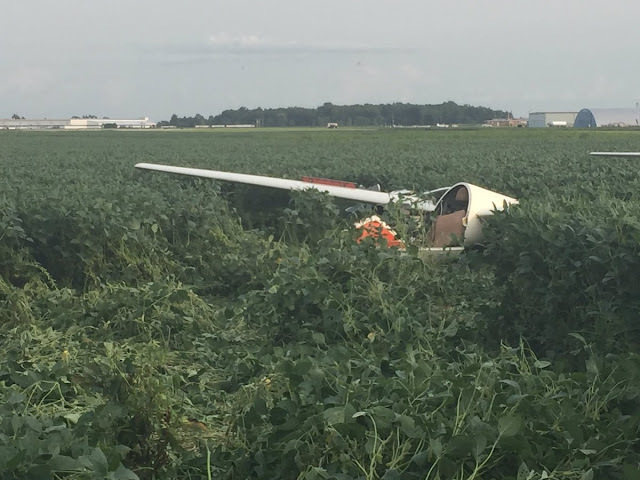 On August 5, 2017, about 1350 eastern daylight time, a Burkhart Grob Flugzeugbau G-102 Club Astir IIIB glider, N102BK, collided with a tree and terrain after releasing from the tow airplane at the Marion Municipal Airport (MNN), Marion, Ohio. The pilot received serious injuries, and the glider sustained substantial damage. The glider was owned by the Central Ohio Soaring Association, Inc., and operated by the pilot as a 14 Code of Federal Regulations Part 91 personal flight. Visual meteorological conditions existed near the accident site at the time of the flight, and a flight plan had not been filed. The flight was departing MNN on a local flight. The pilot stated that he made a mistake during his before takeoff checks and forgot to latch the canopy. He stated that after climbing a "few hundred feet" the canopy came open. While he was trying to close the canopy, he lost sight of the Cessna 150 tow airplane, so he released the tow line and made a turn to the right. He attempted to land in a bean field, but the glider struck a tree and impacted the field. A witness who observed the glider during the accident flight reported that the glider's left and right-wing spoilers were extended during the flight and were visible from the ground. He stated that the glider and tow airplane were unable to climb normally with the spoilers extended. He reported that the glider released from the tow airplane around 150 to 200 feet above ground level (agl) and tried to make a 180-degree turn back to the runway with the spoilers still extended. 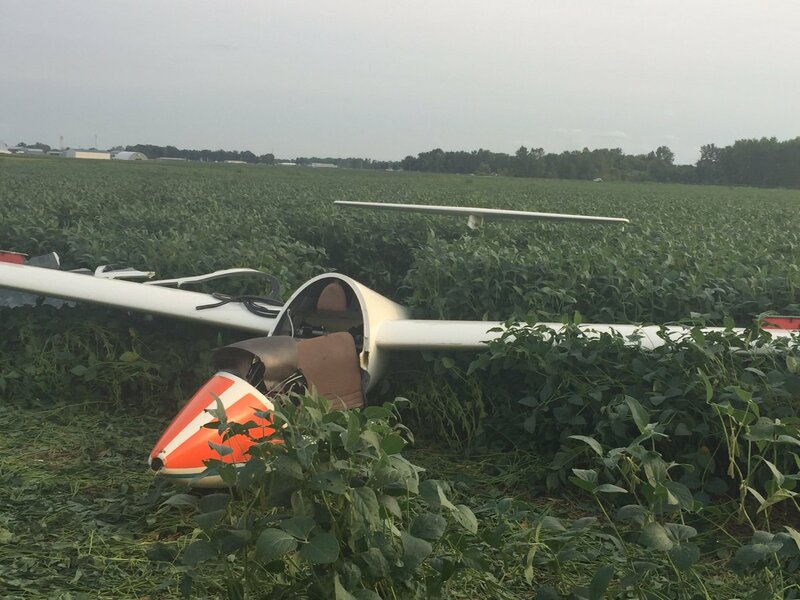 The glider's wing clipped a tree and crashed in a bean field. The tow airplane pilot reported that shortly after takeoff, he felt the tow airplane being "jerked around" by the glider. He saw the glider in a high nose-up position, and then the tow line released about 150 feet agl. The tow airplane continued climbing straight ahead and then returned to MNN and landed. The tow pilot inspected the tow line after landing. The towline and tow ring were undamaged and attached to the tow airplane. The Federal Aviation Administration (FAA) inspector reported that the examination of the glider at the accident site revealed that the spoilers were found in the open or deployed position. Maple leaves were found in the bottom of the spoiler wells. The right wing exhibited impact damage about mid-span. The flight controls were damaged consistent with impact forces. The canopy attachment pins and the surrounding composite material were torn from the fuselage at impact. The canopy attachment handle and bayonet pins showed proper operation. The damage to the canopy was consistent with it being in the latched position at impact. In an interview with a FAA inspector, the pilot stated that he heard air noise in the cabin during takeoff and thought his canopy had become unlatched. He attempted to check the canopy handle during takeoff and climb out while still under tow. In his report to the National Transportation Safety Board, the pilot stated, "We should not have let the need for a rapid departure overlook the need to make sure that the checklists are completed. And most important, fly the airplane." The pilot indicated that the glider had no mechanical malfunctions or failures. At 1353, the surface weather observation at MNN was wind from 280 degrees at 9 knots; visibility 10 miles; sky clear; temperature 24 degrees C; dew point 12 degrees C; and altimeter 30.06 inches of mercury. 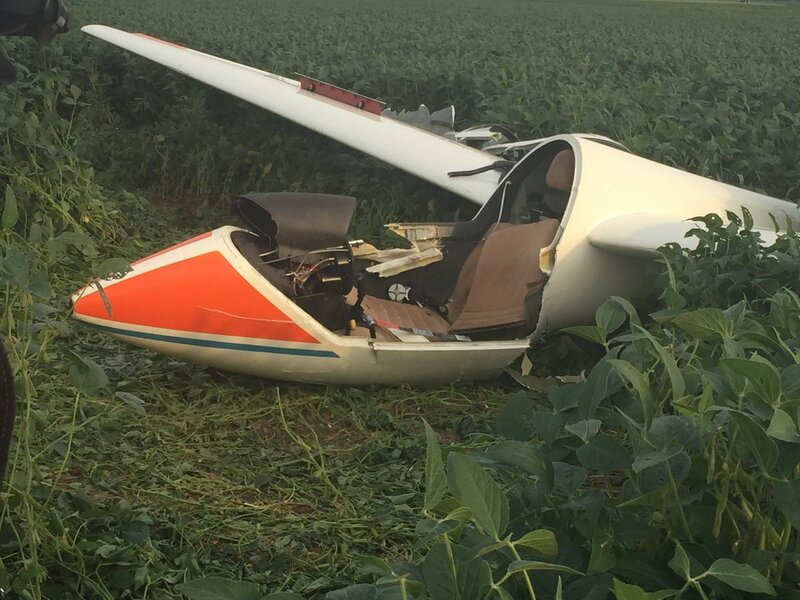 On August 5, 2017, about 1413 eastern daylight time, a Burkhart Grob Flugzeugbau G-102 Club Astir IIIB glider, N102BK, collided with a tree and terrain after releasing from the tow airplane at the Marion Municipal Airport (MNN), Marion, Ohio. The pilot received serious injuries, and the glider sustained substantial damage. The glider was owned by the Central Ohio Soaring Association, Inc., and operated by the pilot as a 14 Code of Federal Regulations Part 91 personal flight. Visual meteorological conditions existed near the accident site at the time of the flight, and a flight plan had not been filed. The flight was departing MNN on a local flight. A witness who observed the glider during the accident flight reported that the glider's left and right-wing spoilers were visible from the ground, and that they were not locked down into the stowed position. He stated that the glider and tow airplane, a Cessna 150, were unable to climb normally with the spoilers extended. He reported that the pilot released from the tow airplane around 150 to 200 feet above the ground, and tried to make a 180-degree turn back to the runway with the spoilers still extended. The glider's wing clipped a tree and crashed in a bean field.